Sometimes a new bestseller leads to older books. 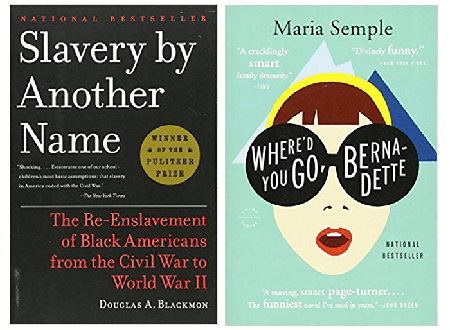 Reading Michael Eric Dyson’s Tears We Cannot Stop led me to browse for his recommended reading, which led me to Douglas A. Blackmon’s Slavery By Another Name: the Re-enslavement of Black Americans from the Civil War to World War II. The book won a Pulitzer in 2009, and PBS made a documentary in 2012. Both challenge any assumption we might make that slavery ended with the Civil War and Reconstruction. Instead, white Southerners arrested thousands of African Americans on trivial charges such as loitering, vagrancy, or even leaving employment without permission of the employer. Judges levied fines, and when the men couldn’t pay, sentenced them to years of hard labor. The “justice” system of the South was debatable: small-town judges were uneducated and chosen at times merely by the quality of their handwriting. Prisoners were leased to employers, and Blackmon documents that the number of arrests rose and fell according to the demands of local farming and mining. Prisoners endured worse conditions than slaves, because sheriffs regarded them as less of an investment – more men could be arrested as needed. Workers lived inside the mines, in water and filth; details of their beatings, torture, and death would be unbelievable but for the mass unmarked graves located near the mines. Mass Incarceration in the Age of Colorblindness. Blackmon, who is Southern and white, acknowledges his own and his ancestors’ privilege as he researches the story of forced labor and contacts Green Cottenham’s surviving family. Slavery By Another Name is shocking and unforgettable, exposing the injustice that shaped our American economy and history. On a completely different note, our latest “filmed in Pittsburgh” movie led me to Maria Semple’s Where’d You Go, Bernadette. I was curious about the plot and characters, and I can picture Cate Blanchette as the sarcastic, sophisticated, eccentric Bernadette. Billy Crudup plays her software-genius husband, and Kristin Wiig is their frustrated neighbor. Bernadette’s 15-year-old daughter, a bit eccentric herself, longs to visit Antarctica, and as the family prepares for the trip, Bernadette (who had been a celebrated architect) begins to collapse into a nervous breakdown. What her family doesn’t know is that Bernadette, unable to cope with finances or responsibility, has hired a virtual assistant from India to manage every detail of her family’s life. The story unfolds in the form of letters, emails, invoices, school memos, etc. from various points of view. My favorite parts were the hilarious rants from Bernadette about corporate branding, progressive schools, parent-teacher organizations, Microsoft office culture, Seattle, TED talks, and glass art installments by Chihuly (“the pigeons of Seattle. They’re everywhere…”) All the odds and ends culminate in a final explanation from Bernadette about why she suddenly disappeared from a ship in the Antarctic. She promises to return and become “more of an artist and less of a menace.” I’m looking forward to the movie, and maybe getting a glimpse of Pittsburgh standing in for Seattle, and CMU as the daughter’s private school.